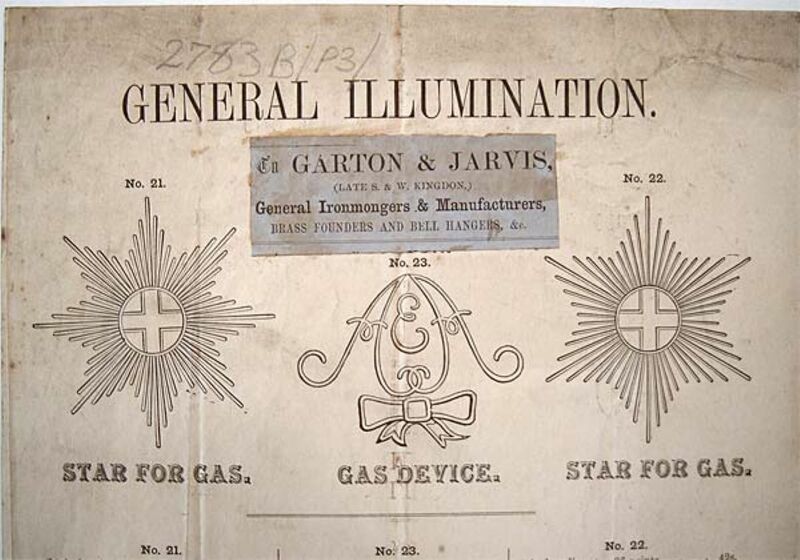 It is often very difficult to source examples of Stationery, ie Letterheads, Bills, Brochures etc, even from the recent past. Examples that I have found of the Company's literature I have included here but there are gaping gaps and the chances of being able to fill them are not good. I have, whilst trawling through the documents at the Record Office left there by Henry Holladay, quite an interesting selection of the Rubber Stamps and Embossed stamps used by the business - anything without the "Ltd" is pre 1925 and cross reference with the Timeline will help the enthusiast in this field to more accurately ascertain the period of each differing style. 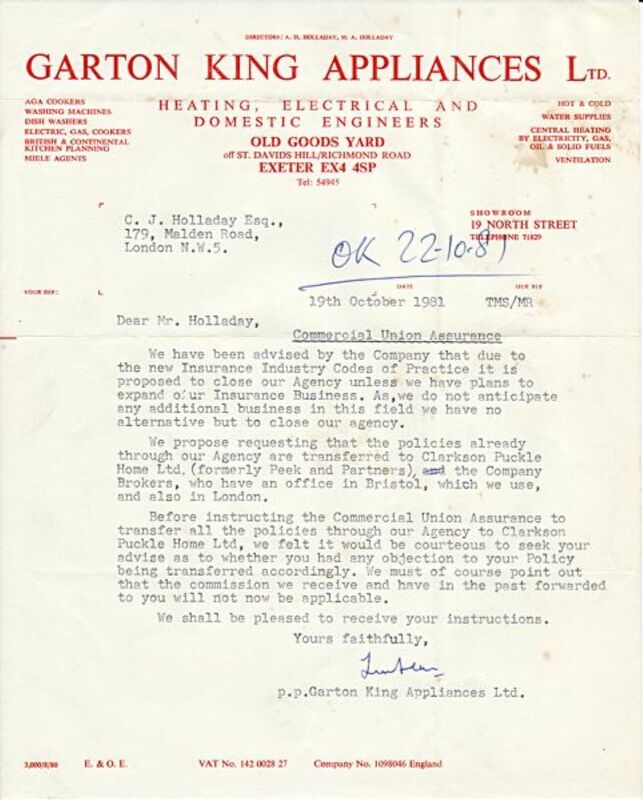 Generally samples of letterheads, even post World War 2, are hard to source. I have examples from the 40s and 50s but the latest I have found to date is April 1973. A variety of printers were used, some no longer exist; names such as W.V. 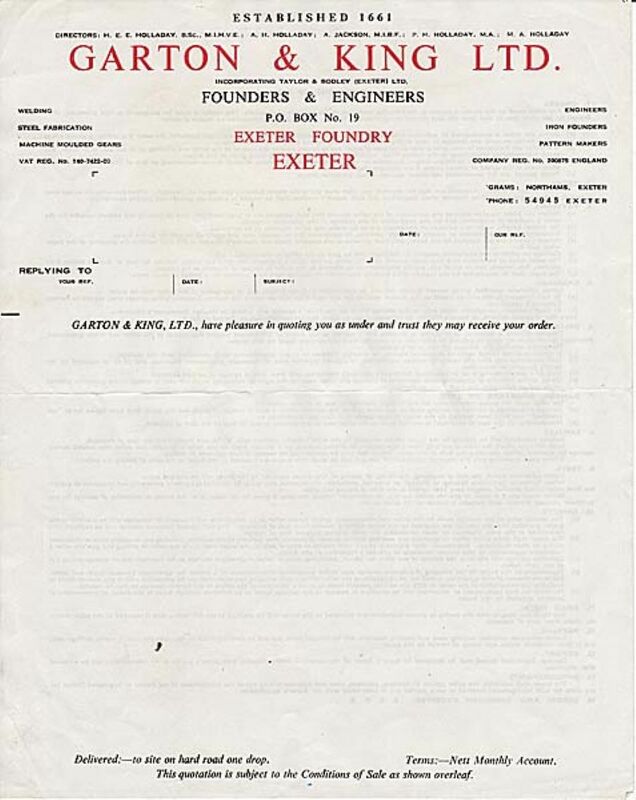 Cole & Sons, Wheatons, William Pollard, Besley & Dalgleish Ltd & the Devon & Somerset Steam Print Works of Exeter appear over the years. 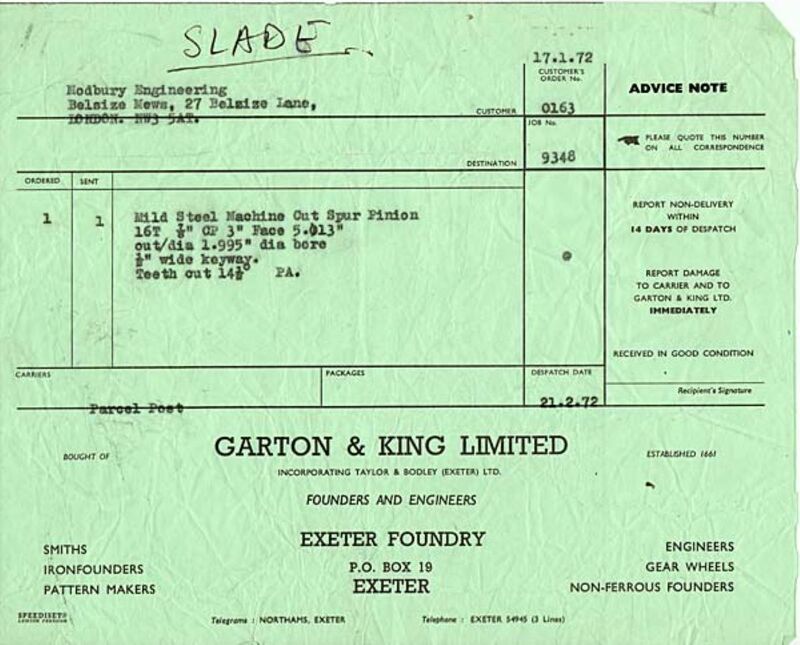 Pollards are very much still in business in Exeter but unfortunately they have not kept samples of the printing that they performed for Garton & King since 1945 and the destruction of their premises during WW 2 destroyed any that they might have had for pre 1940 years but they were, over the years, the preferred printer and indeed the Pollard and Holladay families were friends in my father's and grandfather's era; indeed the Pollard family were offered by my grandfather temporary accommodation in 3 Pennsylvania Crescent after their home was destroyed completely during the bombing of Exeter in WW2, which they eagerly accepted. As is often the case nobody thought of keeping examples of printed matter during the latter years of the business and the thought did not occur to anyone involved in the clearing of the Offices, Machine Shop or Foundry at Tan Lane on the closure of the Foundry to do so. This was 1979 / 80. HOWEVER ! - anyone reading this article is encouraged, particularly if their work is for an established local business, to keep a watchful eye open. The Company installed heating systems in all manner of locations, many in Devon, and supplied castings for many local authorities as well as performing Aga Installations and selling Kitchen Appliances. Machine Work was performed at Tan Lane - and of course any member of staff would have received documentation from the Company in the form of Payslips and internal mail and even Forms of Apprenticeship and matters relating to their general employment and conditions. All these operations would have involved paperwork of some description, whether in the form of a quote, an advice note, a bill of sale, a Tender Document, or just a run of the mill letter. Please contact me if you ever come across any of these items - see the About Me section. Because of the omission of the word "Limited" (Ltd) all the Rubber stamps date prior to 1925 - the description of the operations of the business vary. One particular stamp of interest is the one showing the business as "King & Munk" and this can be dated to approximately 1883 / 1885. 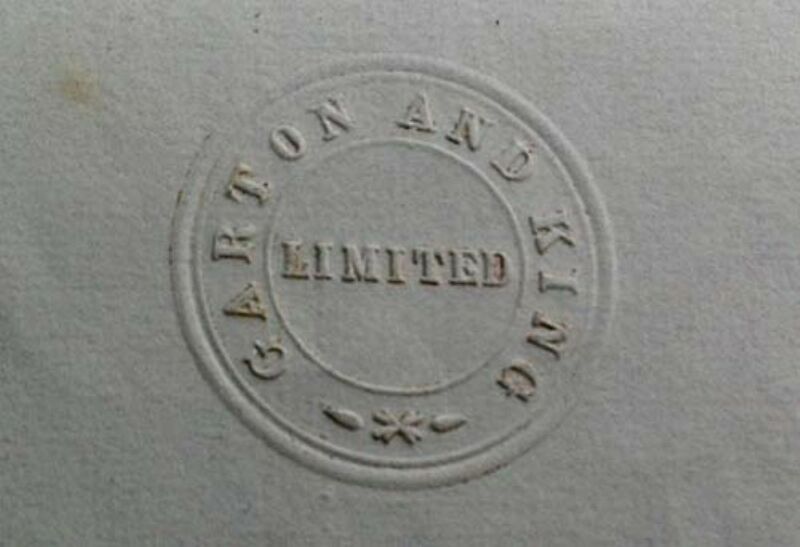 The photo of the Embossed Stamp is from the 1924 / 1925 Document confirmimg the status change of the business to a Limited Company. Inked - King & Munk stamp 1883/5. 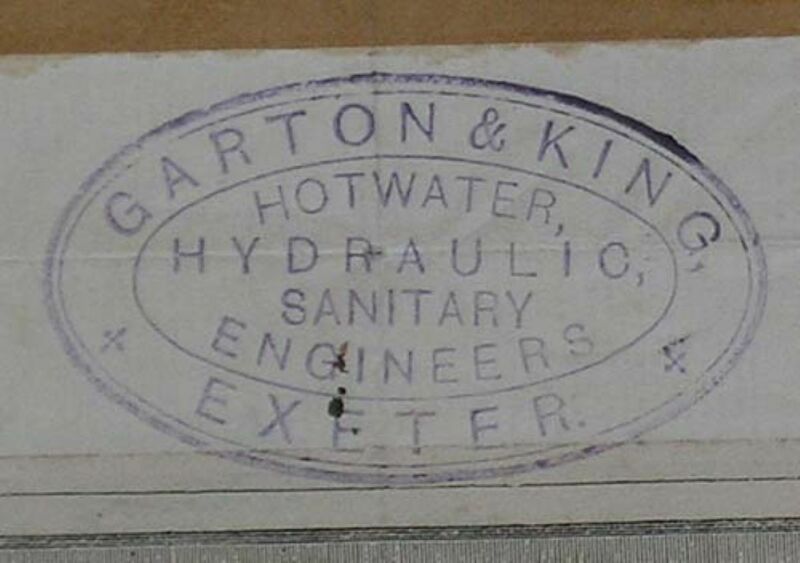 Inked - Garton & King hotwater, hydraulic sanitary engineers. 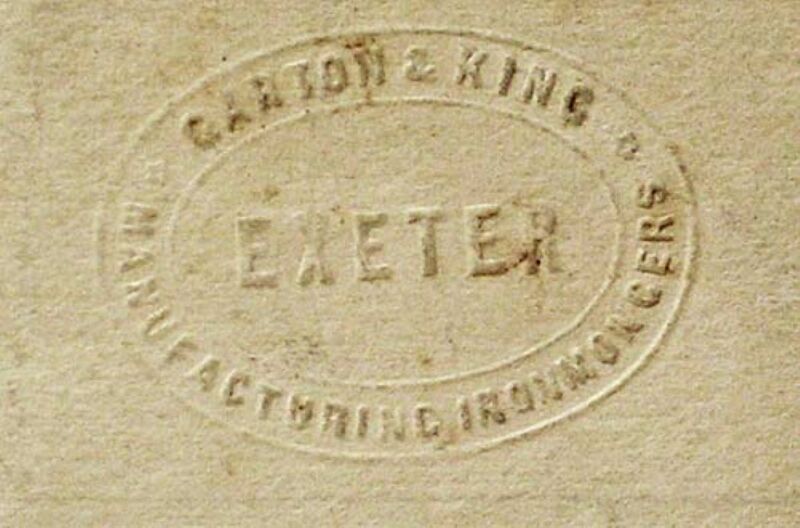 Embossed - Garton & King manufacturing ironmongers. 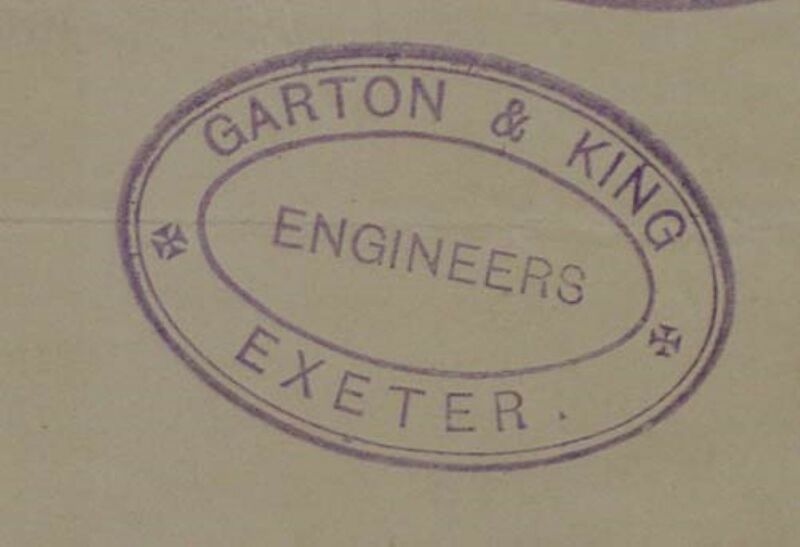 Inked - Garton & King engineers. 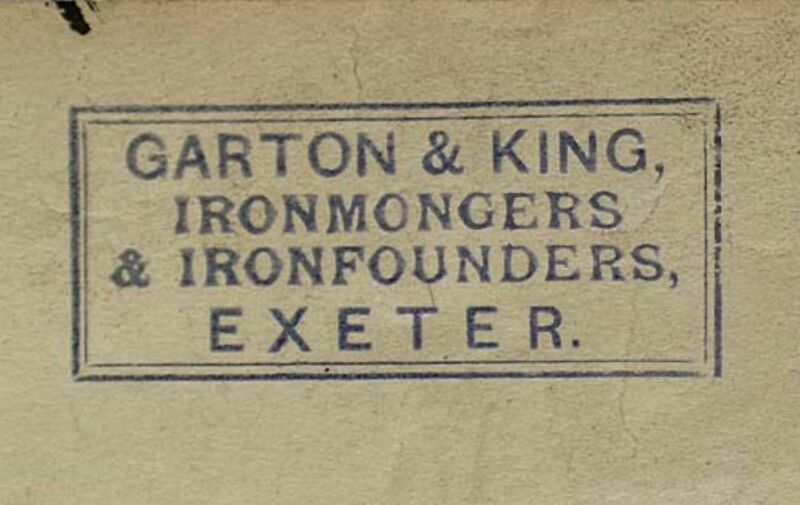 Inked - Garton & King ironmongers & ironfounders, Exeter. Embossed - the first stamp for the newly Limited company. These are in rough date order - the earliest, 1788 is first. This is a small selection from the few examples that still exist. 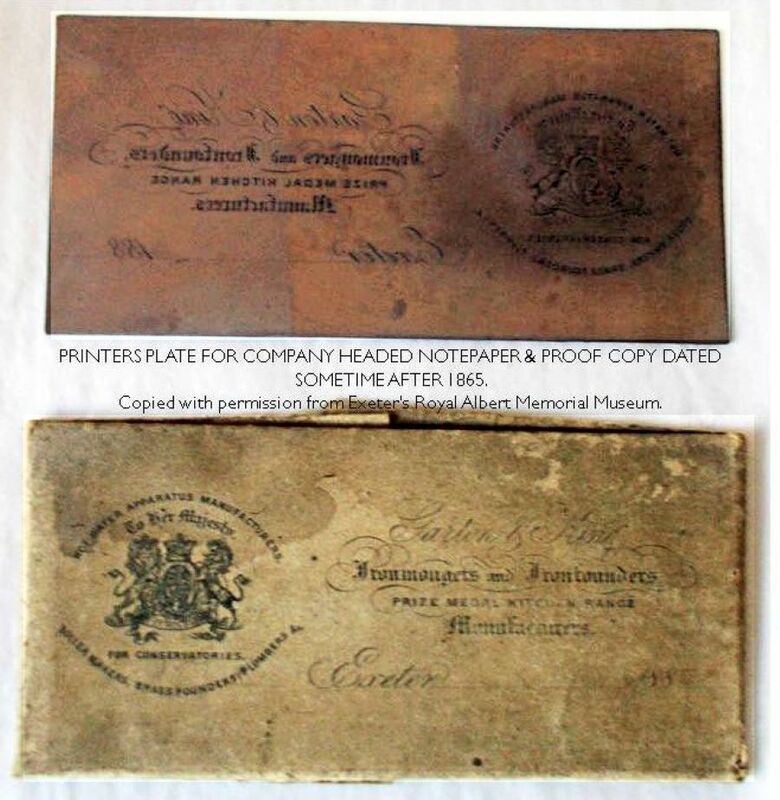 Much economy was exercised in the past and examples in the style of the Blue 1860s notepaper exist purely because they were torn in half and used as scrap or were written on or drawn on the reverse. Quite why blue was chosen as a colour for notepaper escapes me as the black printing does not stand out too well against this background colour. 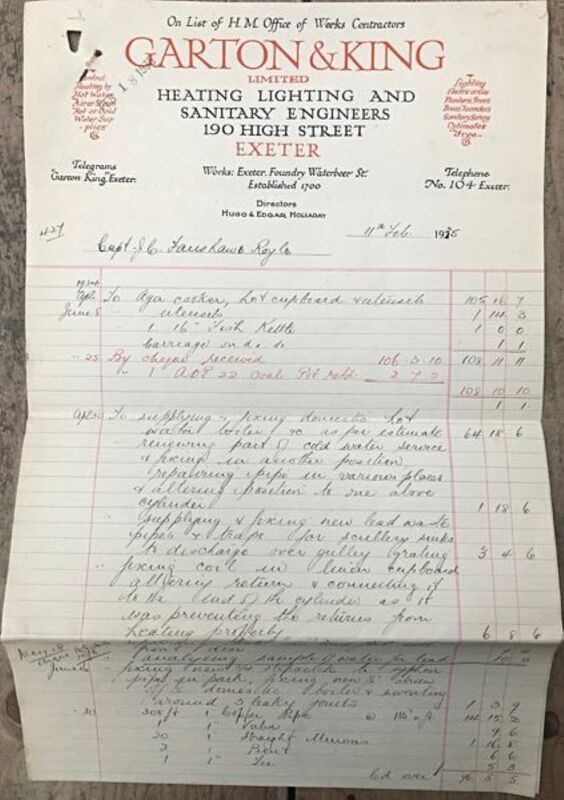 Through my regular searching on a particular Auction Site I have recently (2018) come across a listing for a collection of material that I have acquired all relating to the same customer – as seen in the enlargements – they date between 1935 and 1941 and I have reproduced below seven examples, some may appear the same but are not. They actually cover an interesting period in the Company’s history and three are from the period when the country was at war. On this page is also an image of a Monthly Statement – not something one usually comes across, and an Account Rendered form. More information is shown below. 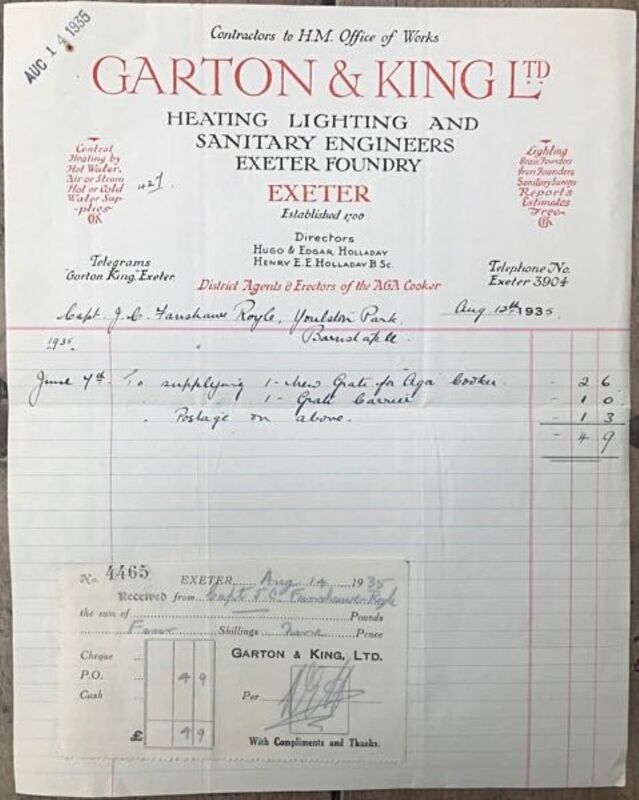 I recall that some headed notepaper was of particularly high quality with the words Garton & King in raised waxed lettering on a good quality paper. It may have been in use either just before but probably just after the Second World War. I am still looking for an example and it is now September 2018. 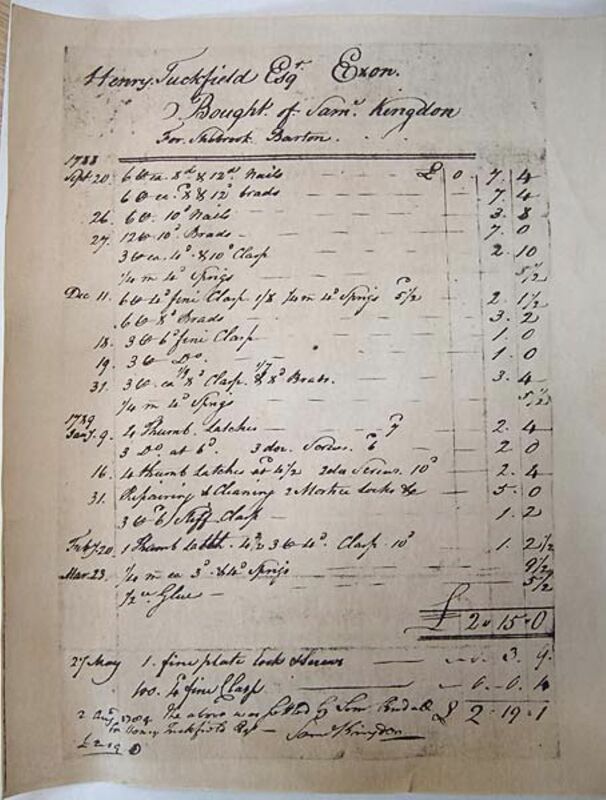 Very early paperwork from 1788. 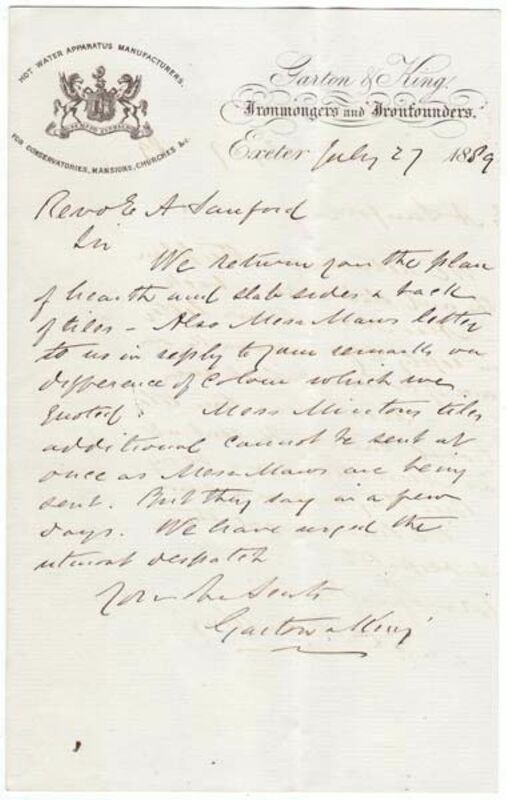 Letter head from 1850 for Garton and Jarvis. 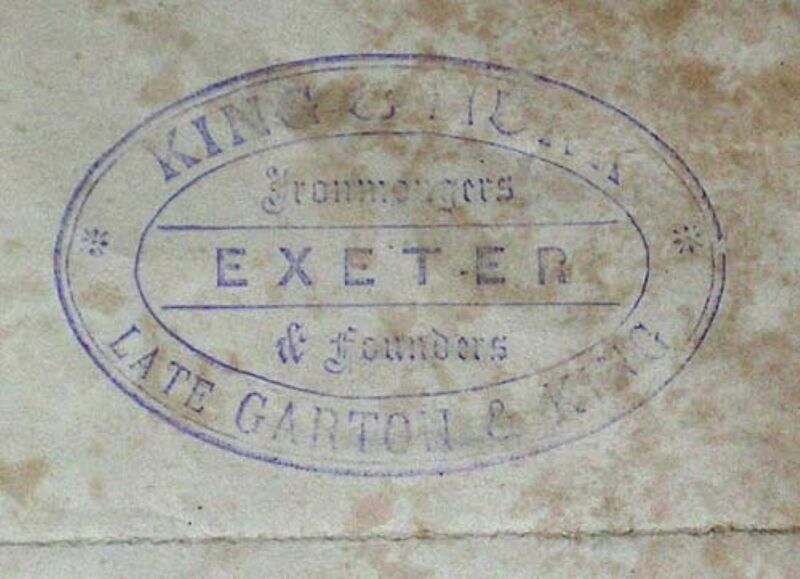 Early Garton & King, (late Garton & Jarvis) letterhead from circa 1860. 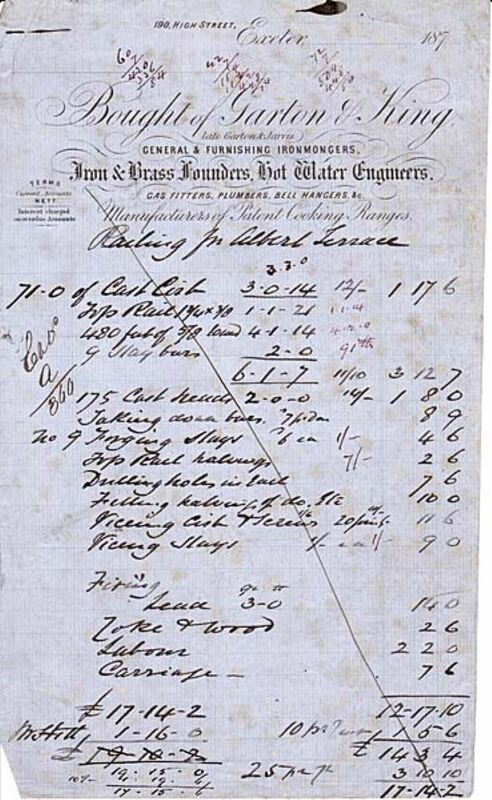 Invoice for iron railing for Albert Terrace. 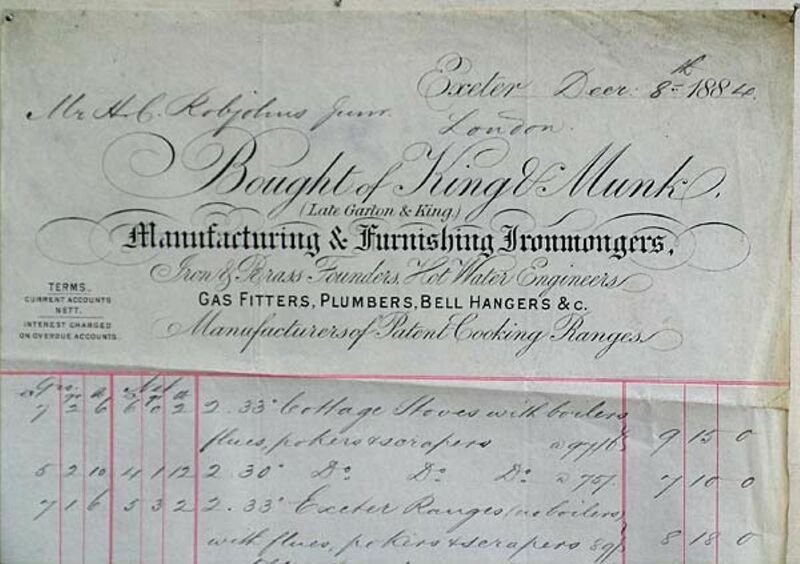 King & Munk Invoice, December 1884. 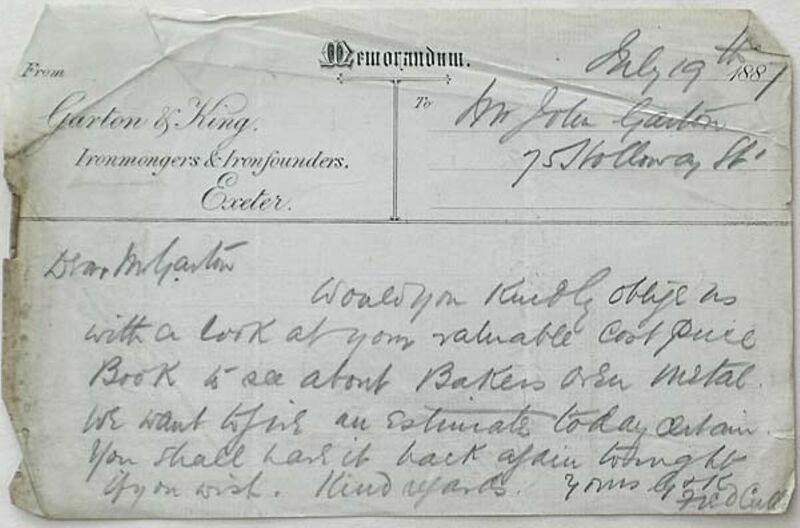 Memo for Mr Garton in 1887 from Fred Cull to borrow his cost book. 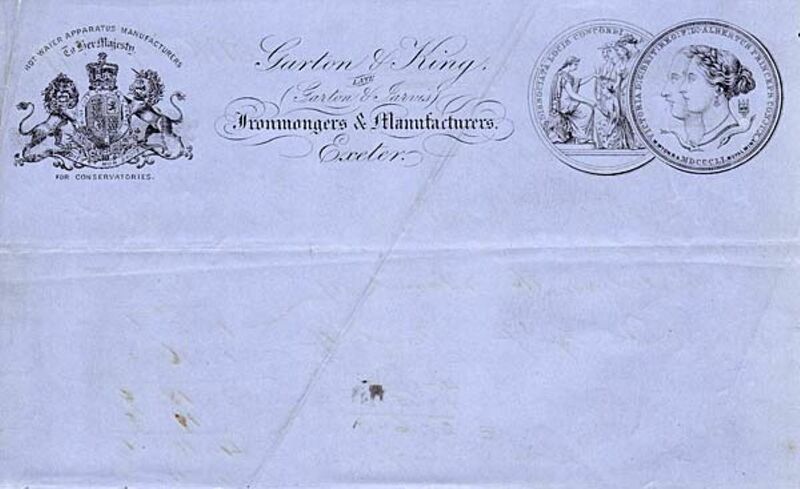 Garton & King letter head 1889. 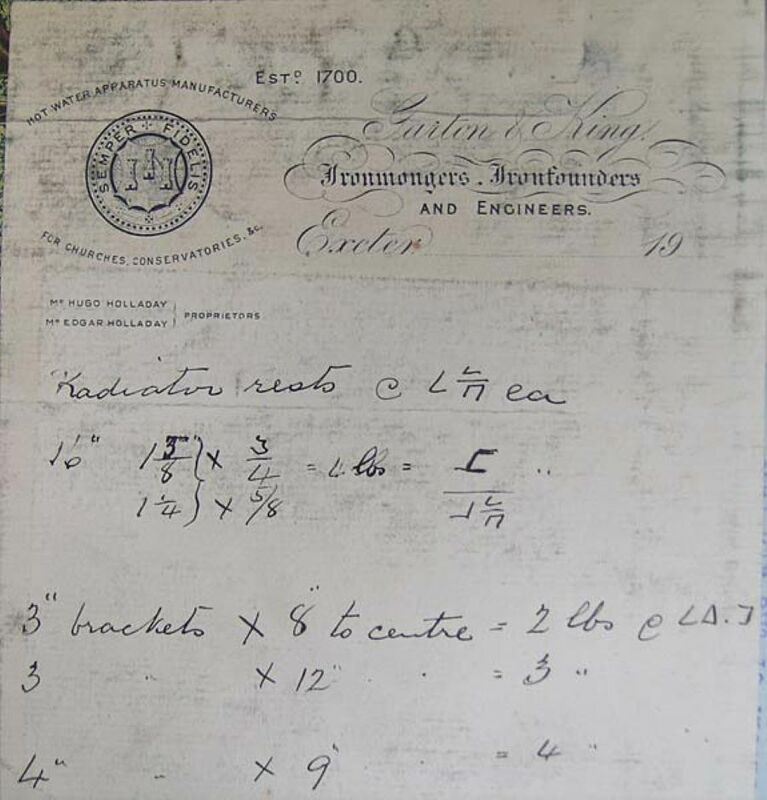 A specification for a radiator circa 1900. 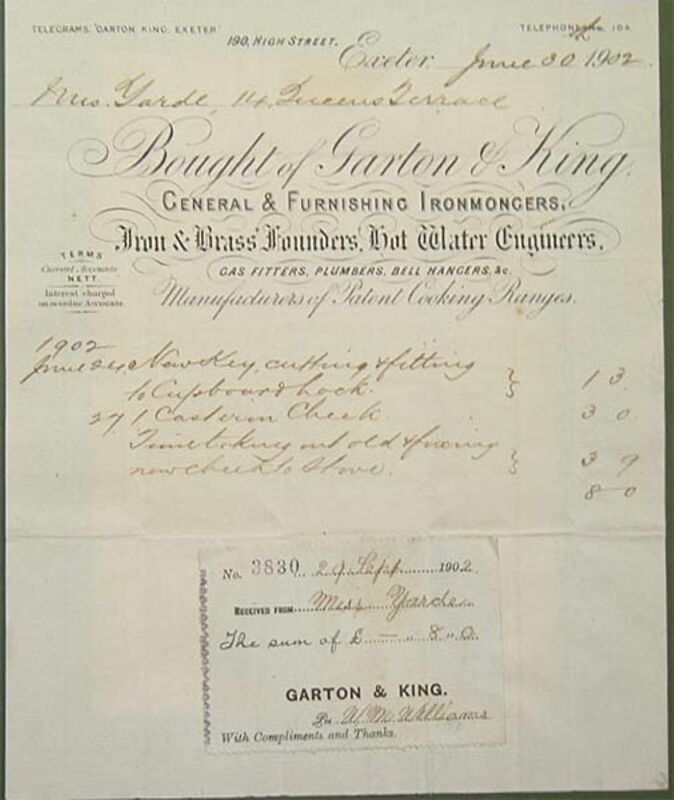 Garton & King invoice 1902. 1935. 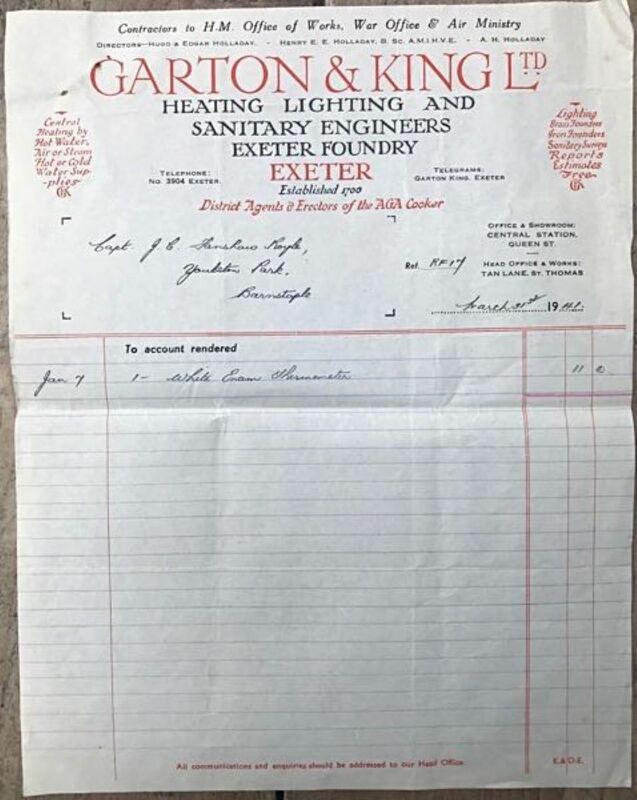 This invoice confirms the Company offices and foundry are located in Waterbeer Street (behind and parallel to Exeter’s High Street) and show the Telephone Number as ‘104’ This is actually 1920s headed paper as you can see the number 2 on the date has been overwritten. 1935. 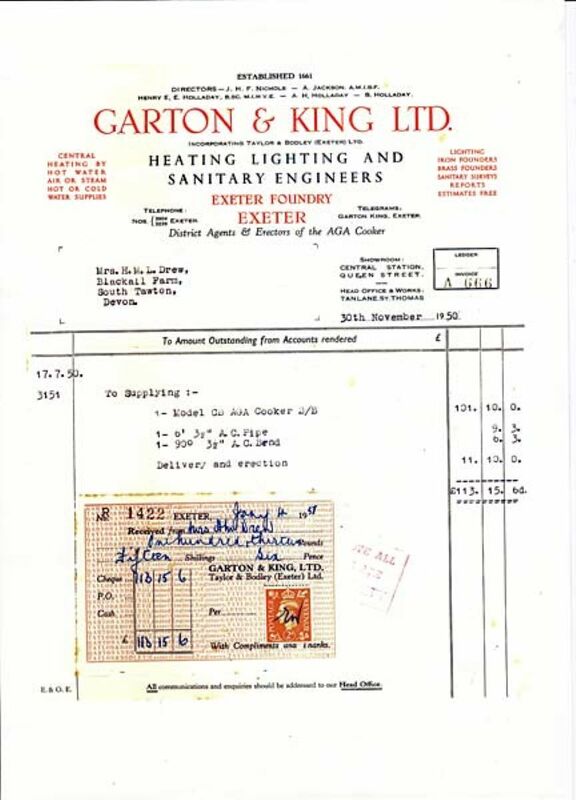 This example shows a different Telephone Number, ‘3904’ and the words ‘District Agents and Erectors for the AGA Cooker’ in red have been inserted. The names of the two directors are laid out in full as opposed to ‘Hugo & Edgar Holladay’ in the previous example. There is no mention whatsoever of the address of either the Works or the Offices. 1939. 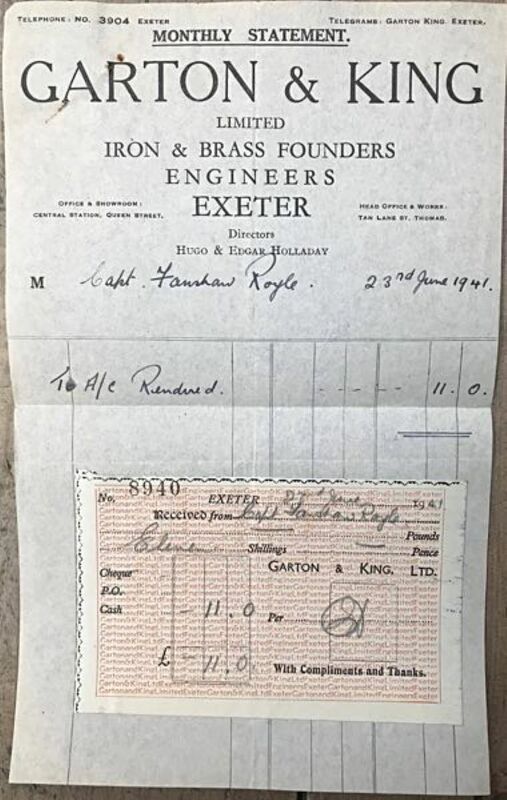 This invoice has changed and reflects the opening in August 1939 of the new Foundry and Offices in Tan Lane and the new location of the Showroom. The date shown is barely a month after this significant occasion. 1941. This example, shows virtually no difference to the previous image other than minor tweaking to the Showroom address but it is an example from Wartime, it being dated 31st March 1941. 1941. This is a Monthly Statement dated 23rd June 1941, still Wartime. 1944. 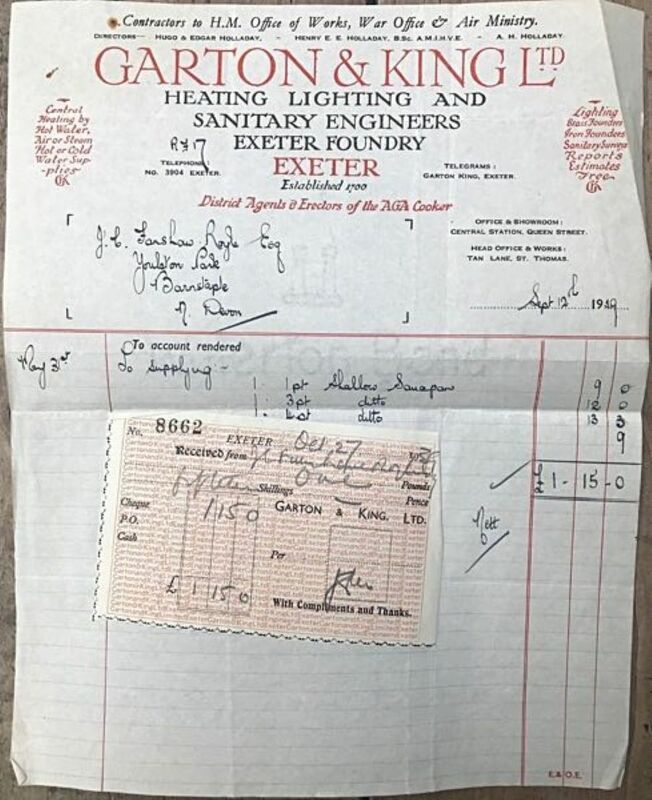 This is an Account Rendered for a Heating Boiler for Holcombe Rogus Church in the east of Devon. Note the Vicar’s complimentary comment! Dated the 30th December 1944 the outcome of the War by then would have been predictable. 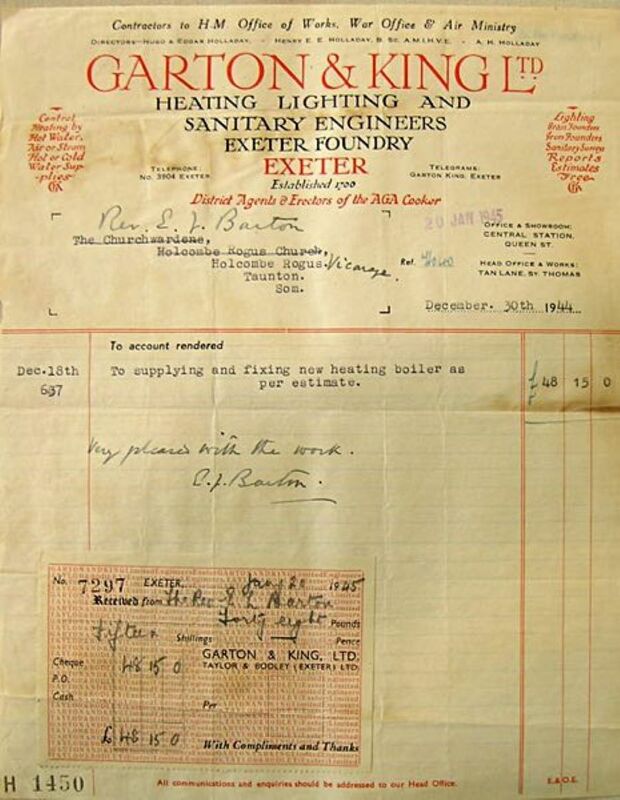 An invoice for an Aga cooker - 1950. Garton & King quotation stationery 1970. An advice note from 1972. 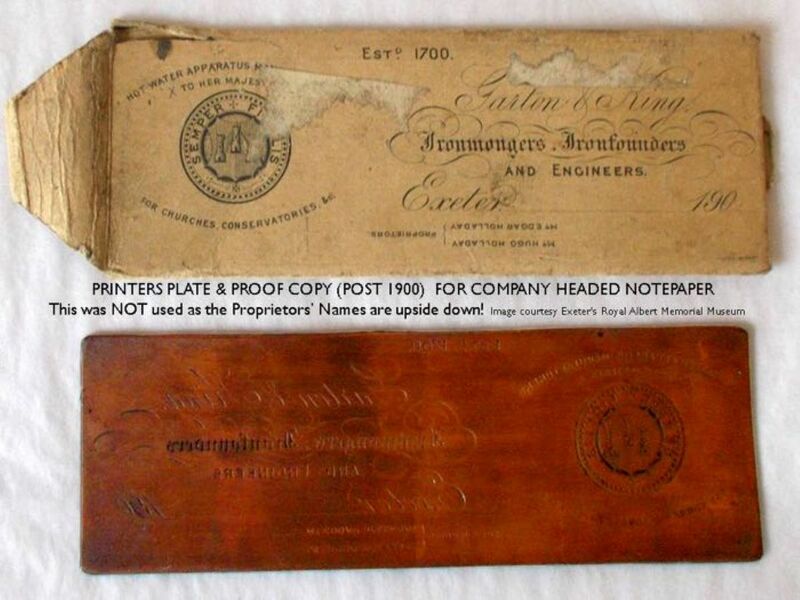 1865 - A copper printing plate and letter head. 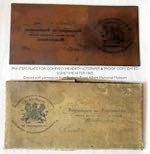 1900 (post) - a copper printing plate and letter head with an error.